When compassion is extended towards animals from their human caretakers, it forms a more perfect bond between us and God’s creation. Although many have held this responsibility as sacred throughout the centuries, man has sometimes taken advantage of our position as lord over the creatures that inhabit our world. Here at Deer Creek Structures, we find it incredibly encouraging whenever anyone takes a stand for better treatment of animals, especially horses. >Over in New York City, a movement is taking hold that is seeking to rid horses from those city streets. According to this article published by NPR, many officials are calling for the end of the decades-old practice of chartered horse carriage rides through Manhattan, especially the newly elected mayor of New York City, Bill de Blasio. In fact, the mayor has been calling for the end of horse-drawn carriages as one of his very first initiatives upon taking office. Many have been saddened by this news, taken as they are with the nostalgia of Central Park carriages through brightly lit streets in summer or in winter. But many animal rights activities have pointed out many reasons why the carriage program is inhumane to horses. Quoted in the above story is Allie Feldman, executive director of New Yorkers for Clean, Livable and Safe Streets. Feldman notes that these horses don’t have time to socialize with their own kind or graze like they normally would as a free animal. On the other side of the fence, some have noted that these jobs give horses a usefulness, and that many of the horses used were themselves taken from abusive ownership situations. 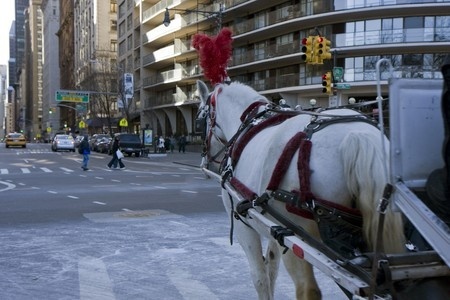 New York City horse carriage businesses also have a great record of caring for their horses. With more than 200 horses and about 160 carriage drivers in New York City, the 16 violations handed out by the city during 2013 by the city’s health department seems like an incredibly low percentage of health issues. It’s important to care for the animals who support your quality of living every single day. For your horses, Deer Creek Structures can provide run-in shelters and horse barns that offer superior equine care. Call us to ask about our barn and shelter styles.